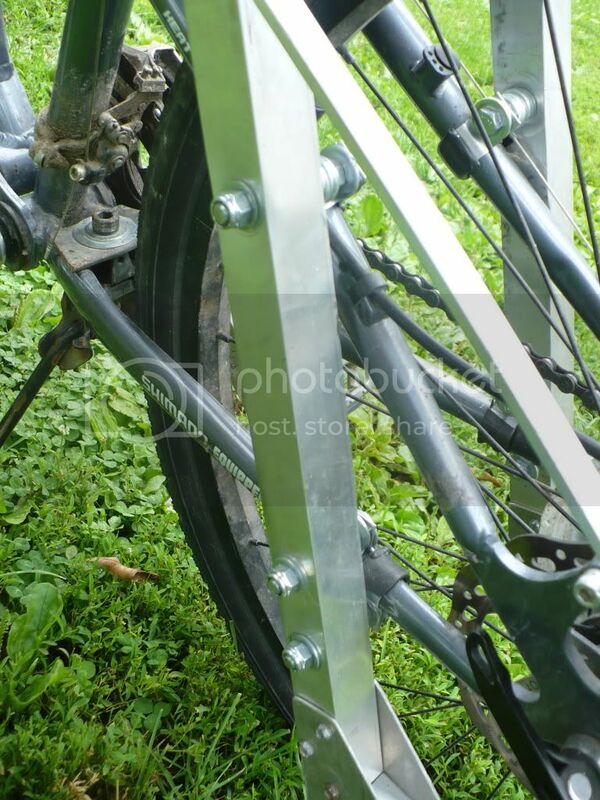 Just a small project to make my bike a little more versatile. The hitch, most of you have probably already seen. I've been adding a rack to it, getting ready to make a pair of pannier bags, and needed someplace to hang them. More of the rack build. While the assembly that goes over the tire (isn't it just a rack?) looks impressive, what's the hitch like? One of the best designs is a ball that allows the trailer to move against the bicycle without tipping it. In this way, the trailer can tip over without affecting the bike. I have a Burley hitch hooked up to my old trailer at the left rear wheel axle. The original hitch clamped on to the left chainstay. When the bicycle tipped over, or vice versa, everything went with it. 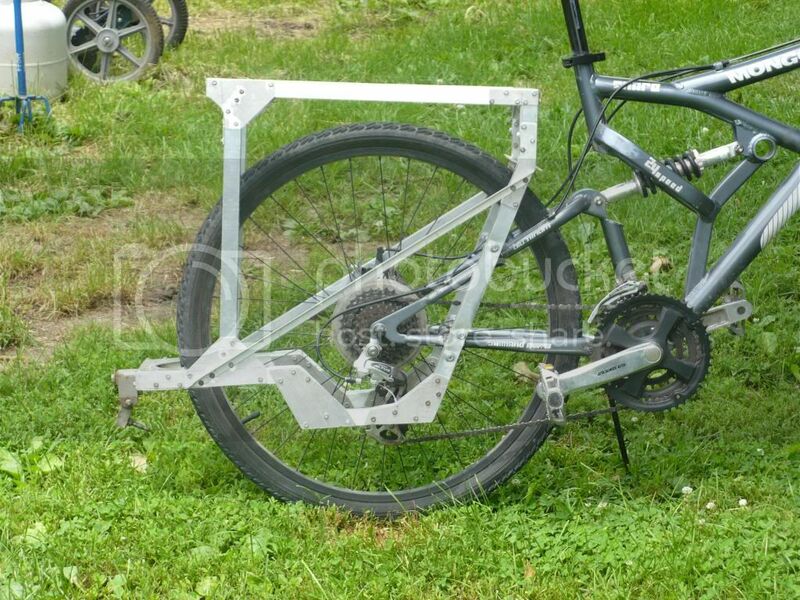 With the Burly, the very modest looking plastic attachment allows the bike to move independently from the trailer. Can you show us a picture of yours? Sorry, thought i had this in that set. This is actually on the first prototype, which has been replaced by the second, pictured in the first posts in this thread. The swivel is the only thing that I saved from the first, because it worked so well. Last edited by Charlie_R; 06-27-11 at 04:04 AM. what's the hitch like? 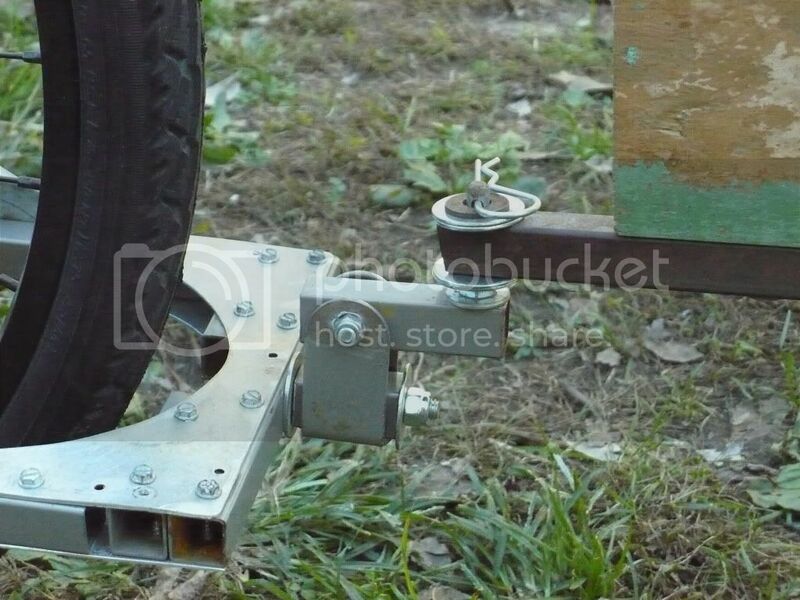 One of the best designs is a ball that allows the trailer to move against the bicycle without tipping it. In this way, the trailer can tip over without affecting the bike. 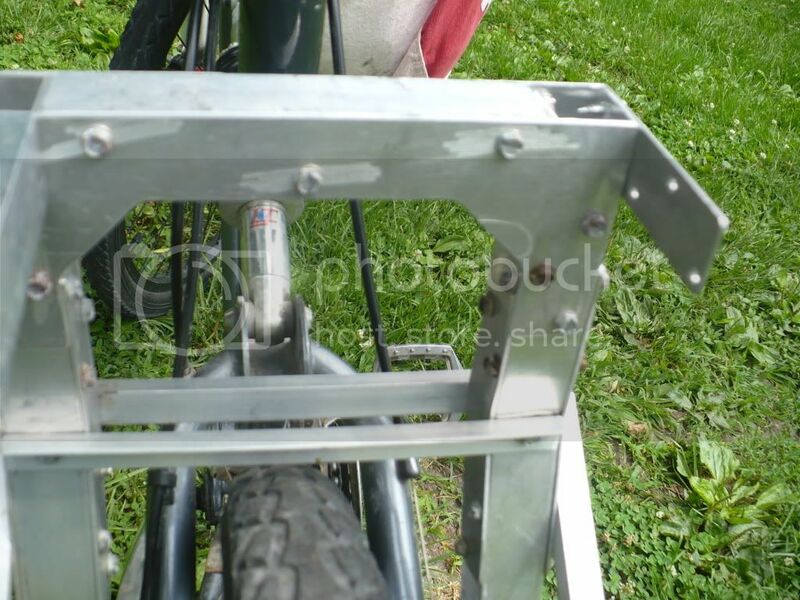 I use a Cycletote trailer which attached to the bike with a swivel/ball joint to either my standard rear rack, or to a special thing that attaches to the seatpost. 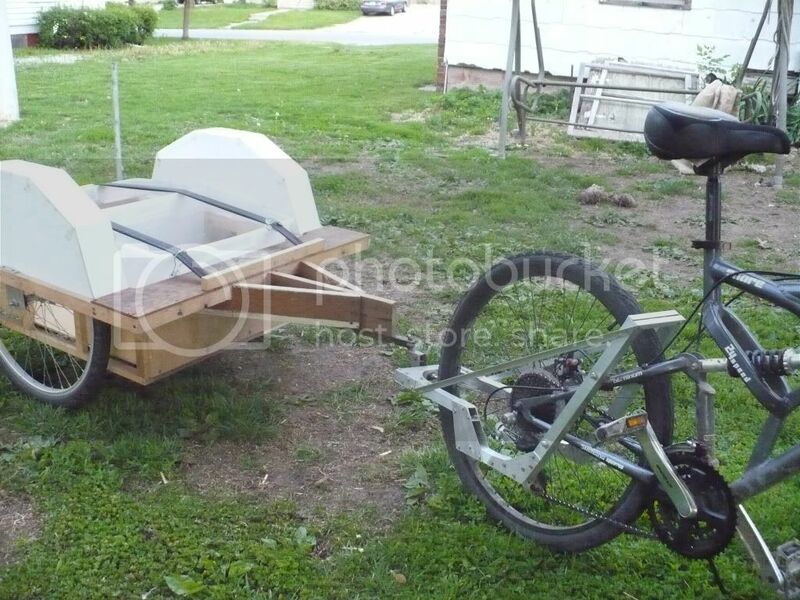 I really like this method because it allows for the trailer to move in any way relative to the bike. Personal preference, I think. I like my hitch point to be as low a practical. The arraingement pictured moves in all three axis, allowing the trailer to swivel side to side, up and down and allows the bike to tilt relative to the trailer. Heim joint? Is it like this? What's the advantage? Each of the bolts in my current swivel set-up require periodic adjustment/replacement due to wear. The heim should last a lot longer, and only need replacement when worn, hopefully after a period of years. Last edited by Charlie_R; 06-28-11 at 04:36 AM. I though the advantage of a trailer was to take weight off of the rear wheel? Nice work on the hitch,looks nice and strong. In actuality, loaded with 100+ lbs of goods, the tongue weight should be only about 10 - 15 lbs. The trailer wheels take most of the additional weight. However, the single wheel type of trailer does put about half of it's load on the bike's rear wheel. That is the main objection I have to the single wheel, due wholly to my own not inconsiderable mass. If i can manage to get back down to my HS weight of 170, that would change the dynamics of the situation. 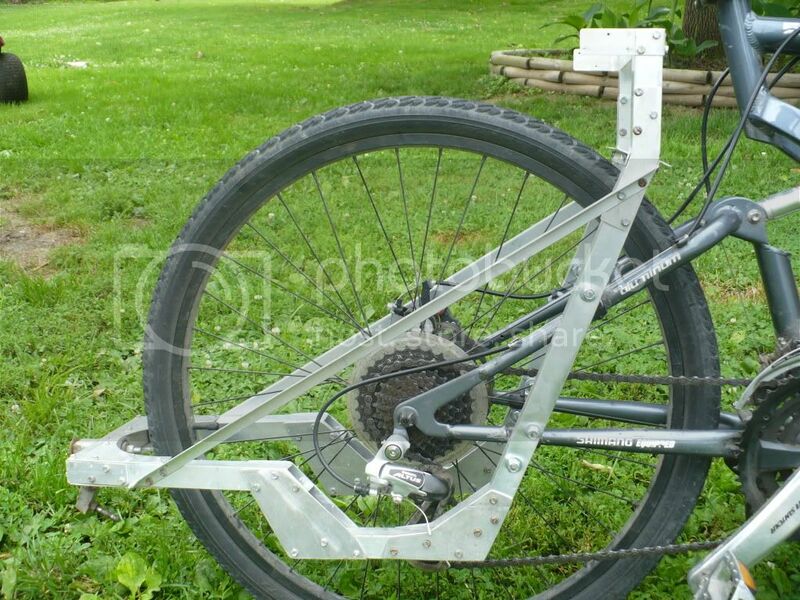 The only weak point in my design appears to be in the attachment to the rear triangle. When the testing of this prototype is over, in about 6 - 8 months, prototype 3 will most probably have a few design changes in that area. I am seriously considering having a local machine shop make some type of pillow block that will take the place of the weak clamps that I am using now. Instead of mounting to the frame with p-clamps,use 3/16-1/4 U-bolts to capture the tube from behind.Use the strenght of your tubing to your advantage,don't isolate it from you bicycle frame with little tin clamps.You can put rubber or whatever between.You'll have enough clamping force to crush the frame if you want.You'll have to tear the rear triangle off of the bike for it to fail.Simple,solid. With a rod end(heim joint) you'll get roughly 30* movement total,depending on the bolt head,washers,ect.Should be fine for a trailer but they are not really designed for that type of movement. http://www.lovejoy-inc.com/,you'll find what you need.You can find their stuff all over the net,been around for 100 years.You can get a small u joint or cv joint.They're the same price as a good rod end.For the big bucks,you can have stainless and needle bearings....Yeah! Last edited by Booger1; 07-11-11 at 10:42 AM. 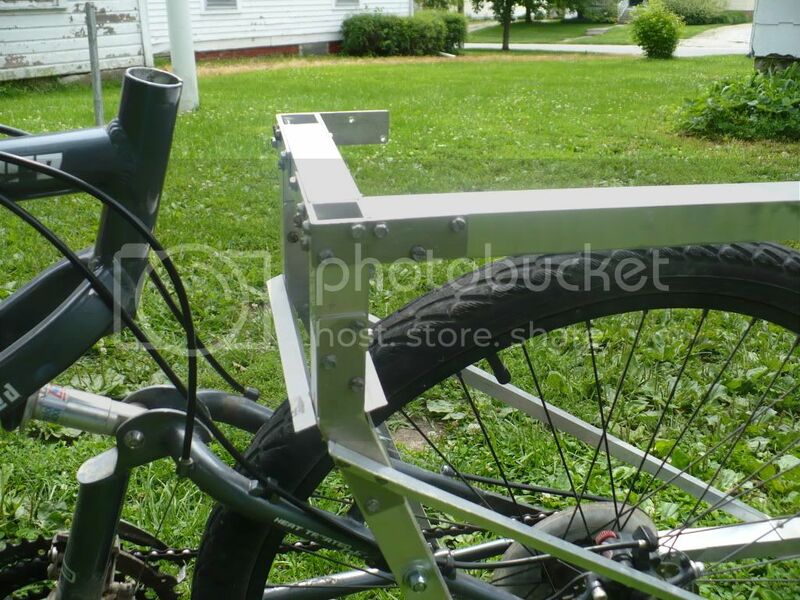 I saw a neat idea for a trailer hitch (that you might be interested in) a few days ago. I may adopt this method for my trailer(s). Made from a steel tube and a swivel caster wheel. 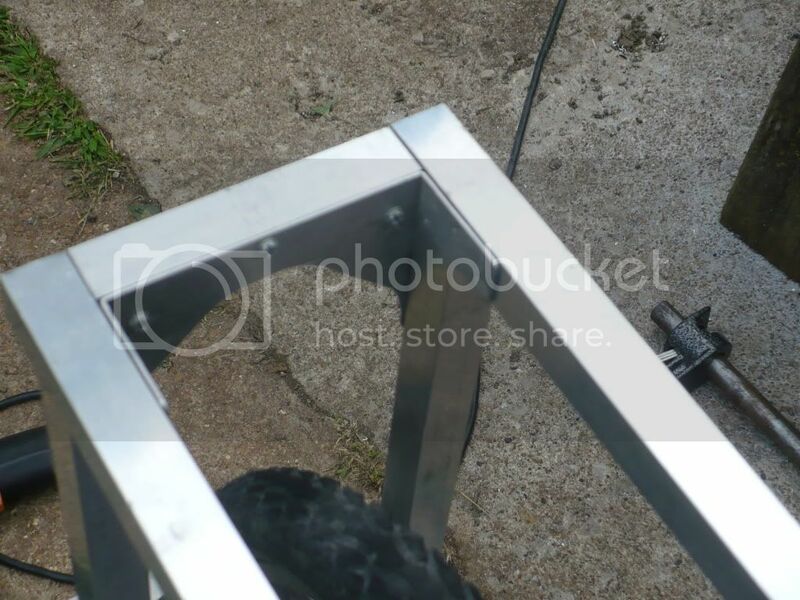 As you can see it has all the movement a trailer hitch needs - Up - Down - Left - Right - plus it pitches (due to the swivel caster) allowing the bike/trailer to tilt when cornering. 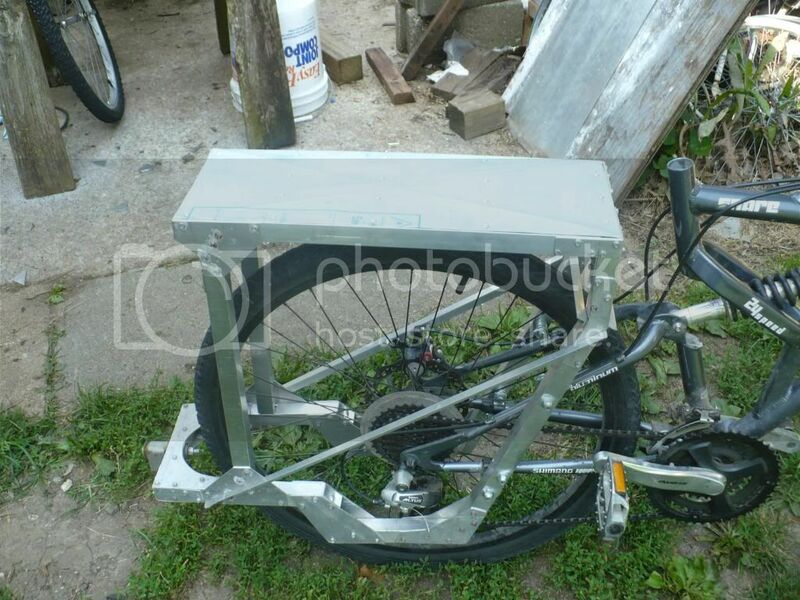 @ timtim2008: welding would save some weight, yes. however, if I recall some of the properties of aluminum alloys, would require a type of heat treatment to relieve stresses at the joints. Otherwise would be prone to cracking near the weld. @ CrimsonEclipse: no, I don't work for Grumman, but I do understand their philosophy. "Anything worth doing, is worth overdoing". As I don't have close access to a welder (Yet!) or annealing oven (welder access involves a 50 mile trip), most anything I do will be with screwed fishplates for now. Not being a school trained engineer, I do rely on the local library and internet for materials properties. 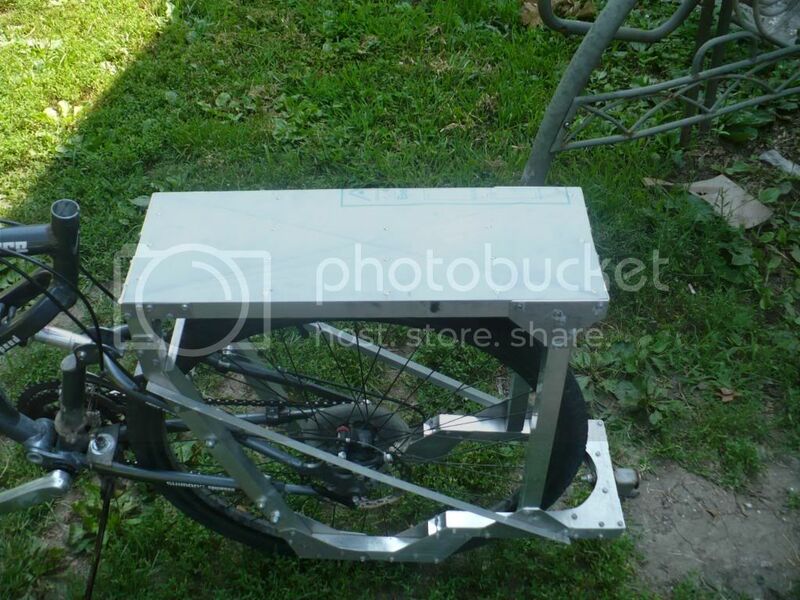 I have been told that if I were to make a production model of this hitch/rack, I could easily sell them for $ 250 - $300 in places like St Louis or Kansas City. I'd venture to bet they would go over big in places like Portland OR as well. 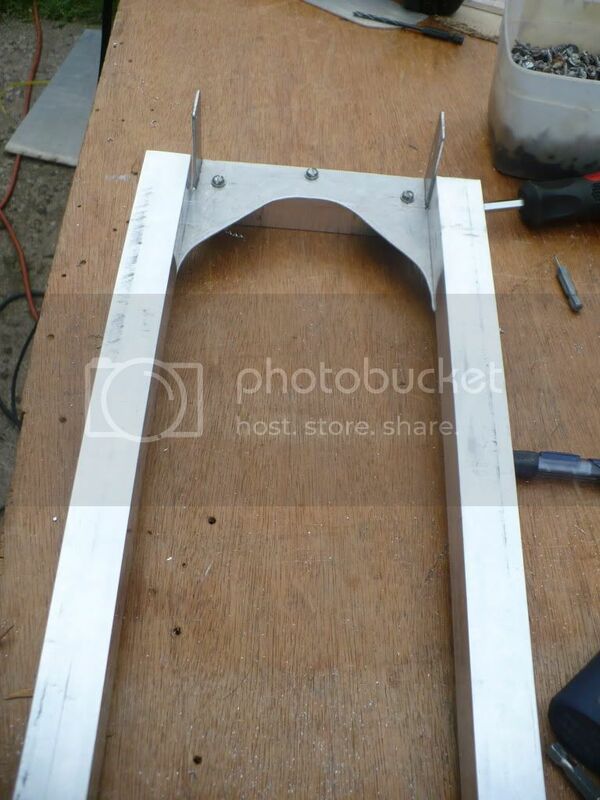 @ Bosscat: Yes, that swivel looks like it would work rather well, but appears to require welding. Not that I can't weld, but as noted above, access is limited at this time. Last edited by Charlie_R; 08-18-11 at 04:32 AM. Did you build your mount/rack from scratch? or did you have plans. I want to try to build something similar. Thanks! I built this from scratch, no plans. I had a need, and some idea of how I wanted it to function. I had tried the axle mounted hitch, and didn't like the restriction on right turns in close quarters. The best hitch arrangement is actually a "fifth wheel" as used by heavy haul trucks. I didn't want my hitch that high, would be unstable with what I do. Next best is a low mounted ball hitch. 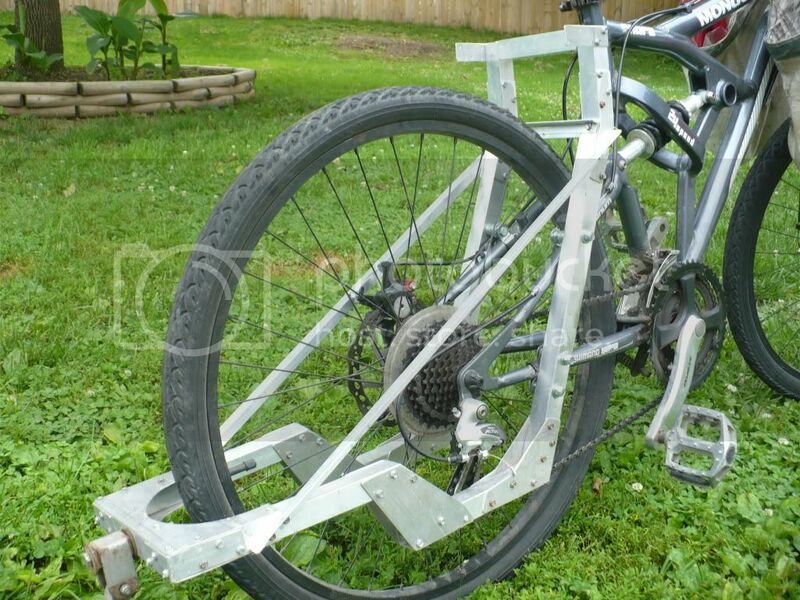 This is patterned after that, with the extra freedom needed for a two wheel vehicle. Made mostly from scrap I had laying around, leftovers from other projects.